The Graduate School of Public Policy is pleased to announce that the doctoral program has launched from AY2016. The main research areas of the doctoral program are International Finance and Development, and International Security. The program aims to nurture highly skilled researchers in law and politics and economics. In addition, it aims to foster cross-cutting, multidisciplinary and practical skills for policy-making. Globalization and major changes in the global environment are presenting modern society with increasingly diverse and complex challenges. Dealing with these challenges demands an advanced skillset—the ability to identify quickly and accurately the key issues from amidst complex phenomena, to apply sophisticated research skills to establish the relevant questions, and to synthesize expert knowledge from various fields to create a set of options for solutions. A choice must then be made from amongst the option set while building social consensus around that choice through communication, and the chosen option implemented expeditiously with an international perspective. Given this new level of complexity and diversity, it is hardly surprising that a growing ratio of international institution and government policy practitioners are doctorate-holders. Responding to these social demands, our doctoral program trains students in the advanced research skills necessary to develop original questions from their research, construct and assess potential solutions that synthesize expert knowledge from various disciplines, and move these solutions quickly into practice with an international perspective, communicating with diverse stakeholders. Our graduates are policy professionals superbly equipped to handle specialist tasks and take the lead in core areas of society—whether they are leading policy development on diverse and complex social issues critical to state operation, representing the government in difficult international negotiations, leading international discussion at international organizations and research institutions, leading major multinational corporate projects that stimulate industry, or effecting social transformation as social entrepreneurs. The program focuses on international finance and development and international security as areas where these social demands are particularly strong and where there is a need for close international partnership. Please see the application package and Q&A for more details. * About half of the 6 places will be recruited from the first recruitment. * Enrollment on April 1, 2020 is also available. * About half of the 6 places will be recruited from the second recruitment. * Enrollment on April 1, 2019 is also available. * Numbers in parentheses indicate international applicants. It is included in total numbers. The doctoral program’s main areas of focus are International Finance and Development, and International Security. As the nature of finance, development and security is such that even domestic policy implementation demands consideration about the impact of the international environment and of international partnership, the program deals with a broad spectrum of international public policy that includes domestic public policy in the context of the international environment and international partnerships. Looking first at International Finance and Development, the globalization of economic activities and the swift transformation of social and political systems amidst rapid scientific and technological advance are increasing the need to address issues from a broad international perspective even when developing and operating financial and fiscal policy and trade and development policy. Taking an international and interdisciplinary perspective and drawing on the economic development experience particularly of Japan and other Asian countries, the program addresses public policy research grounded in the disciplines of Law and Politics and Economics in relation to the design and operation of financial and fiscal policy and trade and development policy, as well as the systemic frameworks underpinning these. In relation to International Security, globalization and other changes in the international situation along with the growing complexity and sophistication of social systems and science and technology are bringing increasing diversity to the threats and risks that must be dealt with. Even in terms of traditional military security, the stable, fixed relations between countries that pertained during the Cold War have now become much more fluid, as can be observed in the involvement of non-state players, the frequency of civil wars and other conflicts, and new types of war. On the non-traditional security front too, we now need to address supply risks in relation to energy, food, water, mineral resources, and economic supply chains, environmental changes such as natural disasters and global warming, and safety and security risks associated with the use of science and technology. The juncture between security and development is also becoming increasingly important as recent cases of migration and political demography show. Again taking an international and interdisciplinary perspective, this component of the doctoral program addresses public policy research grounded in the disciplines of Law and Politics and Economics in relation to the security issues presented by increasingly diverse threats and risks, as well as the design and operation of risk management methods. In addition, recognizing the key role played by science and technology in both these areas, the program also emphasizes interdisciplinary research that includes collaboration with the science and technology fields from a Law and Politics and Economics foundation. Our educational program is designed to develop top-class professionals with not only advanced specialist research skills in their particular fields (either Economics orLaw and Politics) but also interdisciplinary skills and practical skills with international application. First, students undertake research in applied subjects within the two key areas ofInternational Security and International Finance and Development. These subjects are primarily based on Economics and Law and Politics, comprising “International Finance and Development from an economics perspective”, “International Finance and Development from a politics perspective”, “International Finance and Development from a law perspective”, “International Security from a politics perspective”, “International Security from a law perspective” and “International Security from an economics perspective”. To ensure an interdisciplinary perspective, the program also offers two subjects serving as a point of contact with the science and technology: “International Finance and Development from an interdisciplinary perspective” and “International Security from an interdisciplinary perspective”. The next component is “Practical Research on International Public Policy”, designed to equip students with practical skills and taught by professors who are also career practitioners. This is an elective subject, and students will be advised by their supervisors whether or not they need to take the course based on their (practical) experience prior to entering the program. Our educational program focuses on training students in the development of original research questions regarding the diverse and complex current society grounded in an international and interdisciplinary perspective, and in designing and implementing real-world research projects based on those questions. To that end, the course is jointly run by Economics and Law and Politics lecturers, and comprises two compulsory subjects: in the first year, a “Research Design Seminar” attended by students with a whole range of areas of expertise, and a Project Seminar in the second year. In the “Research Design Seminar”, students learn to recognize the different perspectives of different fields, learn to communication with experts in different fields and learn about research methods and research ethics. Each student also selects a research theme framed in such a way that they can explain it even to an experts in a different field. In the “Project Seminar”, students design and implement research projects related to real-world policy issues and present their results to diverse experts and stakeholders, receiving input and feedback from actual practitioners. A key part of the program is doctoral thesis supervision premised on the student developing their research question and then engaging in a research project that includes a real-world component. Thesis preparation for the various majors is undertaken within the compulsory subject “International Public Policy Research”, with supervision under the charge of a main supervisor along with collaborating supervisors. Discussion among diverse students and faculty members, including practitioners, are also encouraged. In the final examination, policy implications of doctoral thesis and implementation challenge of those policies will be also discussed. Both the “Research Design Seminar” and “Project Seminar”are conducted in English and all the requirements for students can be completed only in English. In order to complete the doctoral program at the Graduate School of Public Policy (GraSPP), you must be enrolled for 3 years and earn 20 course credits or more. In addition, you must complete the doctorate thesis supervised by one of the GraSPP professors. 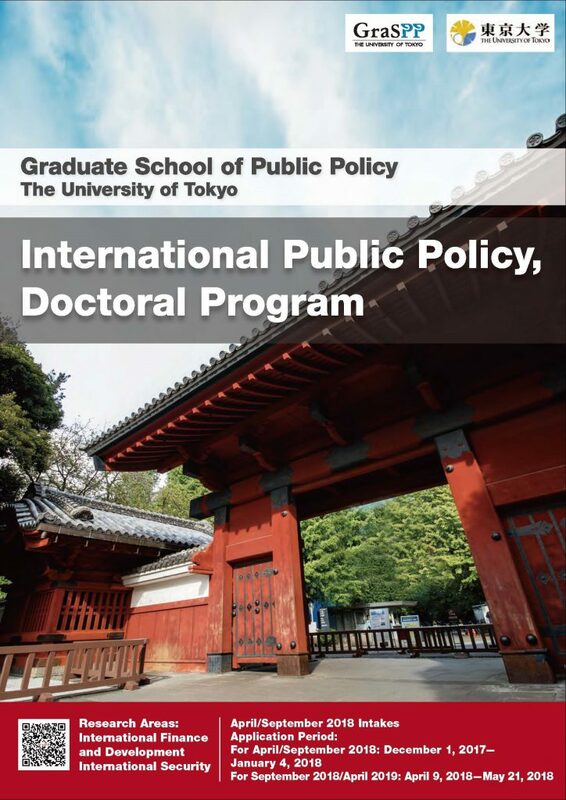 What is the difference between the doctoral Program of the Graduate School of Public Policy (GraSPP) and the doctoral Program of the Graduate Schools for Law and Politics or the Graduate School of Economics at the University of Tokyo? GraSPP doctoral Program graduates are expected to be policy professionals equipped with the intellectual instruments to take the lead in the real world. For that purpose, GraSPP doctoral Program trains students in skills which are necessary in order to develop original questions from their research, to construct and assess potential solutions that synthesize expert knowledge from various disciplines, and to move these solutions quickly into practice with an international perspective, communicating with diverse stakeholders, in addition to advanced research skills. During the coursework, in the Research Design Seminar, students learn to communicate with experts in different fields, and in the Project Seminar, students design and implement research projects related to real-world policy issues receiving input and feedback from actual practitioners. Students must also acquire basic knowledge of both Law and Politics and Economics. In the final examination of the doctoral thesis, the policy implications and implementation challenge of those policies will be also discussed. Do I need to get an approval from a professor by whom I would like to have as a supervisor prior to application? No. You may contact our faculty if you would like, though pre-approval from professors before application is not necessary. I have a full-time job position. Can I enroll at GraSPP doctoral Program? Standard duration for completion is 3 years. Those who have a difficulty in completing the program within the standard duration for personal reasons such as employment may extend the duration of study up to 6 years. The application for the extension is available only at the time of the enrollment procedure. What kind of specialized knowledge foundation should I have prior to the enrollment? and earn credits for the courses in Microeconomics I/II, Macroeconomics I/II and Econometrics I/II held at the Graduate School of Economics. Excellent grades are expected for those courses. Applicants who have previously graduated from a graduate school at the University of Tokyo or at another institution, should possess a background knowledge comparable to the one delivered by the courses indicated above. At the time of enrollment, what level of knowledge is required about other disciplines related to public policy studies, apart from my specialized area? For example if I am specialized in law and politics what level of economics am I expected to have at the time of enrollment? Or vice versa? Based on your academic transcript and performance during the oral examination, the examiners may judge that you do not have the necessary foundation in other public policy areas at the time of enrollment and require you to take and pass the designated extra 4-credit equivalent of economics or law and politics courses during your doctoral study, depending on your major. I obtained a master's degree in a graduate school whose language of instruction was in English. Do I still have to submit a TOEFL score? Yes. In the case of a master’s degree (not a bachelor’s degree) received abroad, students will not receive an exemption. Can I submit a GMAT score instead of a GRE score? No. We do not accept a GMAT score instead of a GRE score. What kind of paper/publication is regarded as an equivalent to the master thesis? Please send any material that is relevant to the research proposal you are envisaging to GraSPP. This may include any thesis written at the professional degree program at GraSPP or any published academic papers or policy papers. Revised thesis or research paper etc. are acceptable as well. GraSPP Master’s degree program students are required to complete a “Thesis” (course code: 5150020 / 5150021), not a “Research Paper”. Who should I request to write the letter of reference? Those who can evaluate your performance properly. At least one letter must be written by your academic supervisor. Can the two letters of reference be submitted separately from the rest of the application documents (i.e., submitted directly by the referee)? Yes. The referees can send letters of reference directly to the admission office. In this case, please ask the referee to make sure that your name is clearly written both on the envelope and on the letter. My university does not issue a “Certificate of Graduation.” However, there is a date of graduation (MM-DD-YEAR) on my official transcript. Is that sufficient to prove successful completion of my degree or is a separate document necessary? If the graduation date is included on the official transcript, we will accept it as a substitute for a certificate of graduation. Is it possible for my college to send official proof of graduation and any official transcripts directly to the admission office? My college would prefer to send such documents directly to you by express mail. Official proof of graduation and official transcripts can be sent directly to the admission office from your school. Please inform us if your school will be sending these documents directly to the admission office. I do not have a credit card for e-payment. Can I directly deposit the examination fee into the University of Tokyo's bank account? Firstly, you should know that the credit card used for payment does not have to be your own. A relative or acquaintance may execute the payment on your behalf. In this case, please clearly state the credit card holder’s name as well as your own name on the checklist of your application package to let us know that the payment is from you. Please refer to the https://e-shiharai.net/english/ for more detailed information regarding e-payment. If you cannot make the payment through e-payment for any reason, remittance to the bank account of the University of Tokyo is also acceptable. You can get the account information from the admissions office. I have relatives who live in Japan. Can I ask them to make payment on my behalf at the admission office? No. We do not accept cash payments. Please remit your payment to the designated bank account. I am a non-Japanese resident in Japan. Do I still have to pay the JPY 30,000 examination fee for applicants residing in Japan instead of the JPY 10,000 for applicants residing outside of Japan? Yes. Your examination fee will be JPY30,000 if you reside in Japan at the time of application.